Organic Control digests unwanted organic debris and reduces excessive nutrient content that contributes to organic matter and enhances filtration. 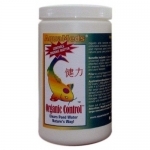 Organic Control also stabilizes water quality, thus improving pond conditions for aquatic life. One ounce (spoon enclosed) for every 1,000 gallons of pond water. Mix the proper dosage with 4 to 5 gallons of clean pond water and spread around the edge of the water. For larger ponds, mix half the dosage in 4 to 5 gallons of clean pond water and spread across one half of the pond, mix the other half dosage and spread across the other half of your pond.